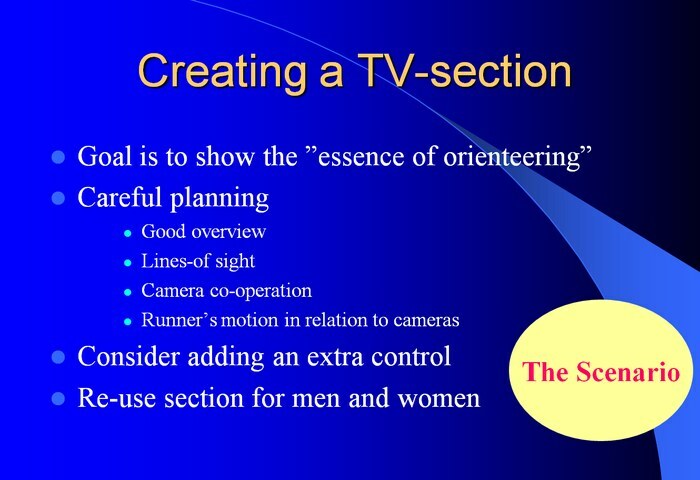 This section covers aspects related to camera footage in orienteering TV productions. Focus is on items which are specific for orienteering broadcasts. A section discussion "Best practise" has been set up. This section will evolve during the project based on input from different sources. The best practise section is thought to give some input for a future production manual for orienteering TV productions. Note! Camera footage is also linked to Competition formats, Spreading methods and Storytelling. These best strategies are a result of discussions at the TV Workshop in Stockholm February 2012. If more cameras are to be added for an individual start race, increase the duration a runner is shown at each of the locations (e.g. start - 1st control instead of only start or pre-warning-last control-finish instead of only last control to finish). For each TV-split, control-to-control philosophy ; show at least 2 controls for each split. Need 2-3 cameras (but more is better). Need a good camera workflow - different camera angles. One camera on a tripod in an open field to give you 50 seconds split is cheap but gives boring TV. No speed, no emotion. The duration for each TV-split should be long enough for the commentator to talk about the runner - at least 30-40 seconds. It can be longer, but then you should not use the complete split for all runners, only for the last. Also, exit time after the split time stops must be around 10 seconds to make sure the commentator has time to talk about the time. Use picture-to-picture transitions and avoid panning when possible. Avoid filming athletes from the back. Need easy visual identification of each TV split, i.e. distinctly different look for the two TV splits to make sure the viewers know which split time they see at once. Always show graphics with place/name of location (e.g. "Intermediate 4.5 km") and also athlete name with running time (which stops at TV split). See section Graphics for more about the graphics. For a first-to-finish races (chasing start / mass start / relay), more locations must be added, and thus also less cameras for each location. Typically a minimum of 5-6 locations and 1-3 cameras at each location. 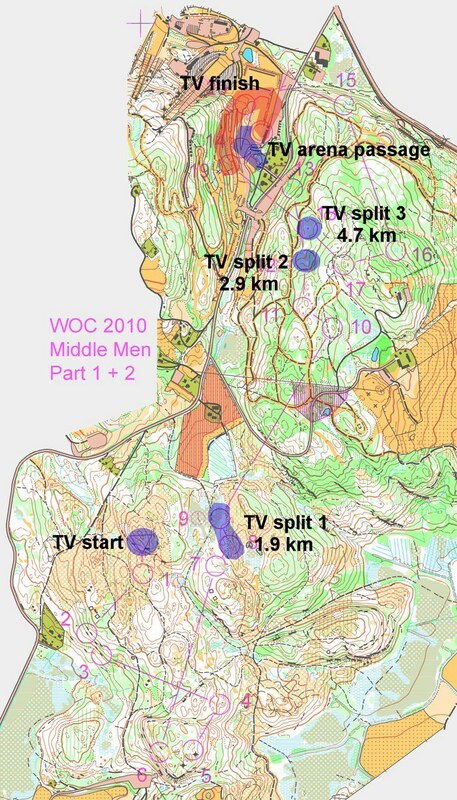 Example WOC 2008 Relay. This worked very well for the first and last part, but there was a break for nearly 25 minutes in the middle. Generally, the long clips in open forest with 3-4 cameras and varying camera angle work very well. Typically, camera footage is shown from 3-6 location in a broadcast. 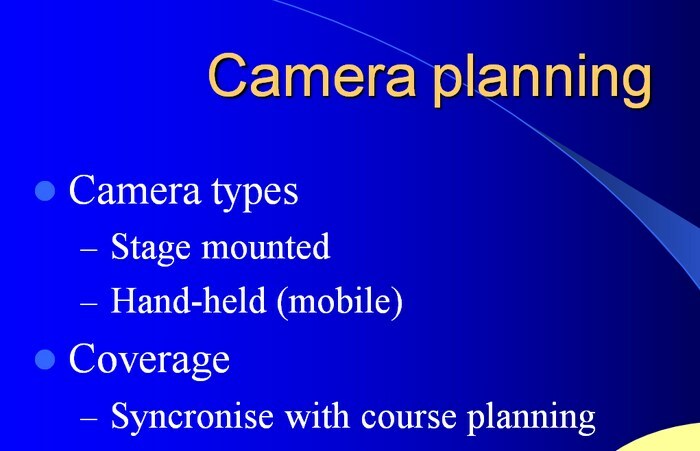 In the current project one aim is to look at camera footage from previous TV productions from orienteering and categorize them according to a number of objective criteria (see below). In addition, exceptionally good camera locations/footage is to be identified (based on more subjective criteria) in order to highlight which locations work better than others. This project does not plan to focus on camera positioning, but some general remarks are included for now. Camera positioning and general guidelines on what to show for start and finish could/should be agreed on. For instance for the start: First wide angle shot (whole start box) and then close up with a runner and graphic layout. Same at finish, first wide angle shot and close up when the runner crosses the finish line. This page was last modified on 29 March 2012, at 23:55.